Click on any image to enlarge slideshow. 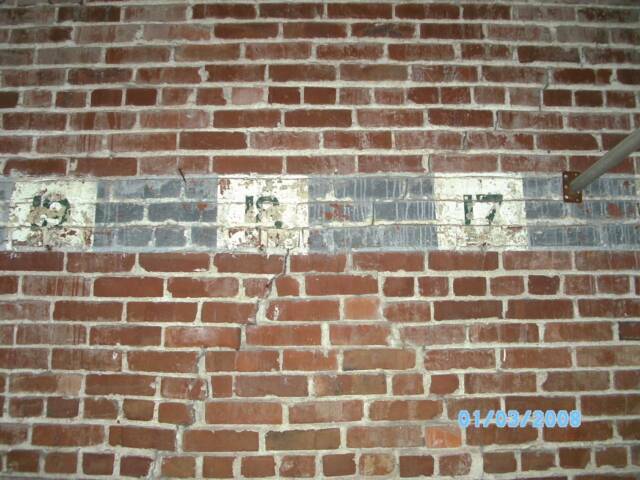 Originally built as Wilson Power and Light Company before 1930, this structure was designed as an ice plant, and has been continuously used for production and storage of ice since that time. It was common for electric companies of this era to operate in a variety of enterprises such as ice, natural gas, and telephone companies. 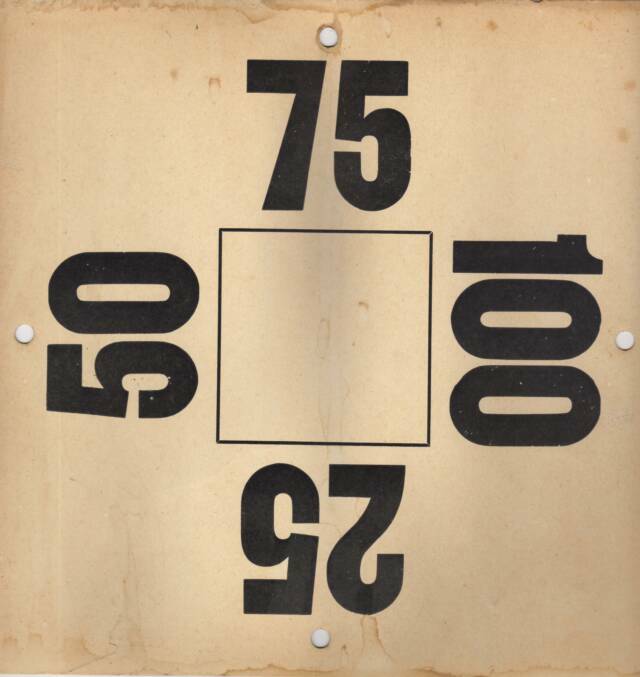 The property was sold to Arkansas Power and Light in 1931, and on August 19, 1942, AP&L president C. H. Moses sold the property to Delta Ice Company, a partnership between Roy R Morley and Vance M Thompson. 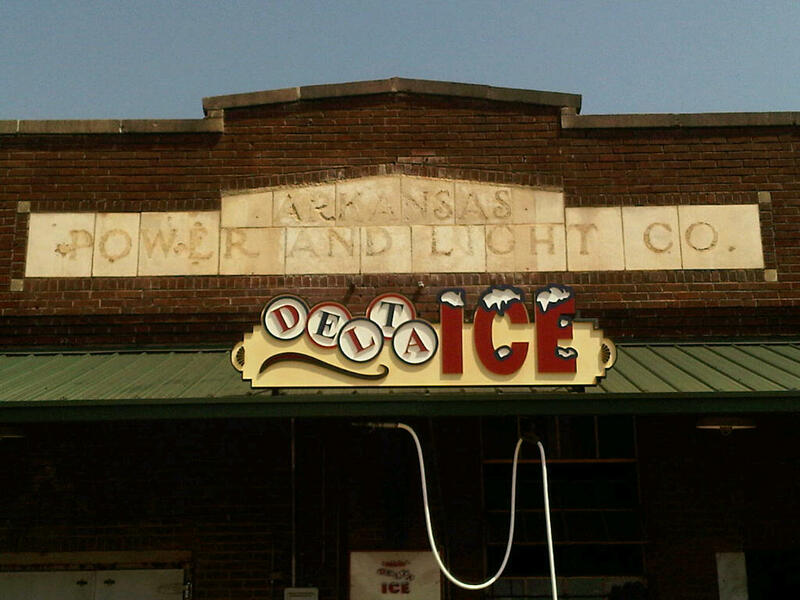 The original facade on the building read, "Wilson Power and Light Co", but was changed to "Arkansas Power and Light Co" prior to the sale to Morley and Thompson. 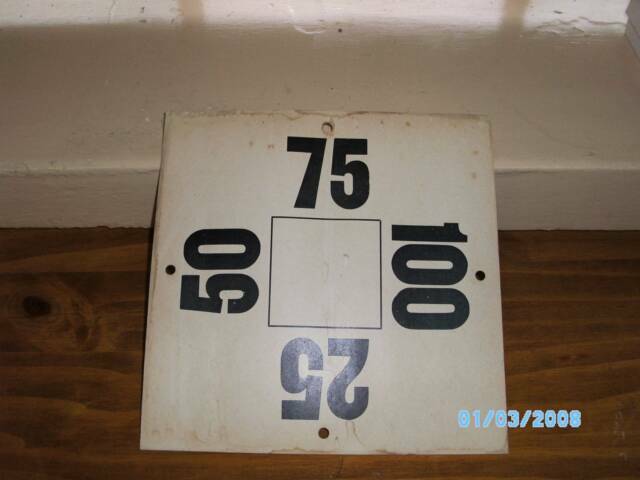 In 1966, Roy W Morley, son of Roy R Morley, took over the company, followed by Bobby Proffitt from 1982 until 1998 (with his sons and one of his brothers), then Tommy and Sue Burns from 1998 through 2010, and then to its current owners, Jerry & Kelli Burns in May 2010. Four generations of our family have worked at the icehouse in West Memphis, and the first two worked for Arkansas Power & Light Company as well. 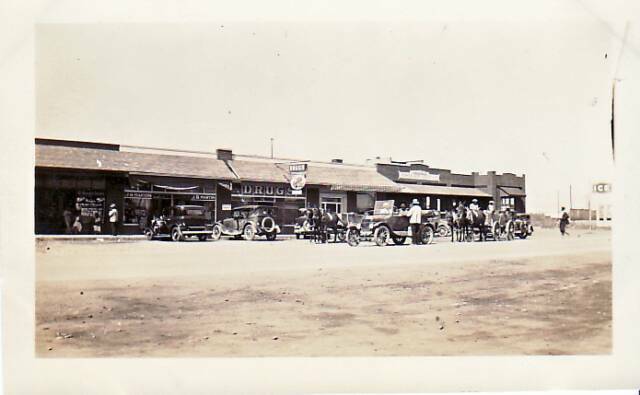 The photos below were taken in 1932. In the first two, you can see two buildings. 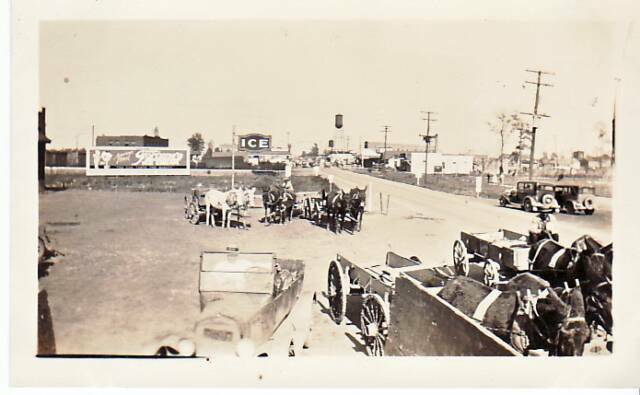 The one on the right is the Wilson Power and Light Co icehouse, and the one on the left foreground is the drugstore/soda shop (Spotts drug?). In the third you see the old "Ice" sign that was in our lot for several decades, until it was accidentally knocked down by a vehicle (somewhere between 1985-1990). 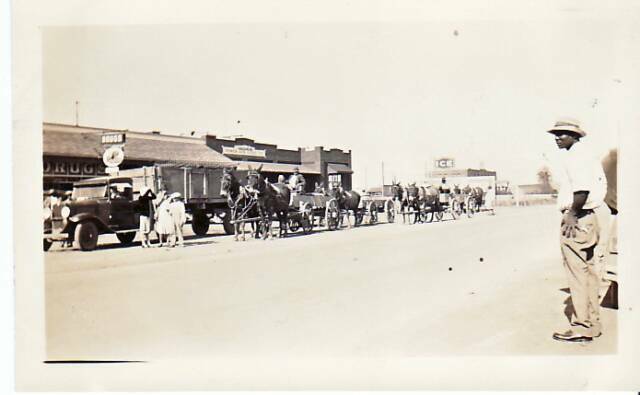 This was a time of emerging technology--horse and mule drawn wagons next to automobiles. Over the years, the ice industry has changed significantly. 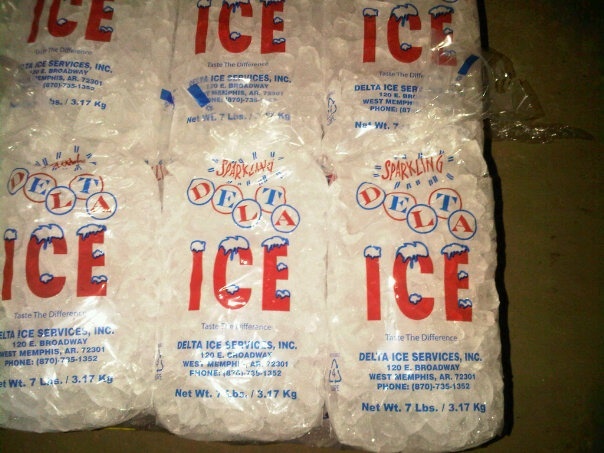 In the early years, ice was made in large blocks (300 pound blocks) and cut into smaller sizes for use in "iceboxes" in homes, or for water coolers for workers. etc. 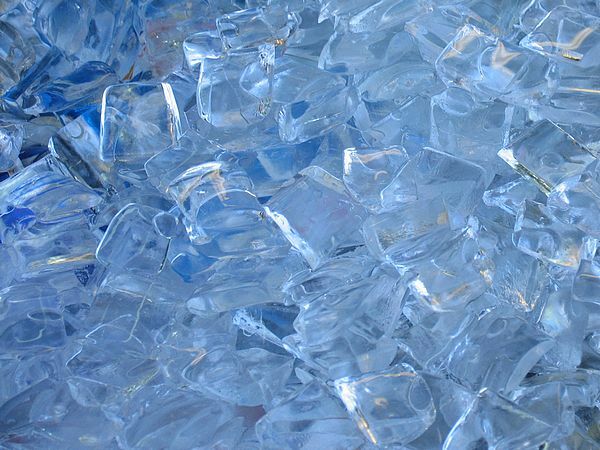 As technology improved and electricity became commonplace, demand for this type of product slowly began to fade, and crushed or cubed ice emerged as the dominant product in the ice industry. Convenience stores and bottled or canned drinks called for a more versatile product, and icemen around the country began to change icemaking equipment to produce this kind of ice, and new packaging systems were devised to streamline the process, making it more efficient, and more importantly, making the product more sanitary. The wooden dock may have been replaced, but we may never replace this old wooden bench. A man offered to buy it a few years ago, but we just couldn't bring ourselves to part with it. Who knows how many sore feet have been comforted by a quick rest on this thing? Ours have many times! Coupons like those in the photo to the above right were sold by ice companies in an attempt to eliminate having to carry cash or make change at the time of sale. Customers would buy the coupons in advance and redeem them for ice. This also helped increase sales. These particular coupons were found during renovation of the office at the icehouse. 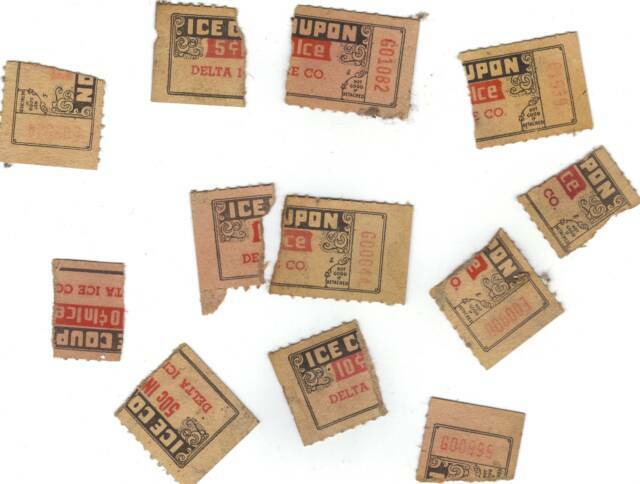 You can see "Delta ice Co" and the face value on some of them (5, 10, or 50 cents). Once redeemed, they were torn in half. Today we still use the old warehouse freezer for storage of ice. 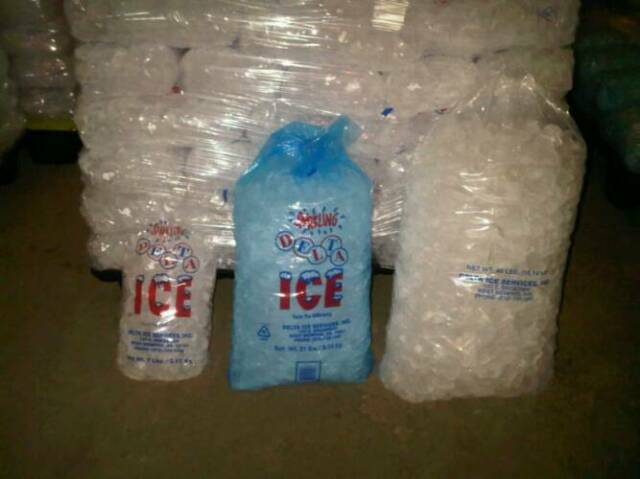 We have seven, twenty-one, and forty pound bags of crushed ice, as well as ten and twenty-one pound bags of snow ice (snowcones!). We still make blocks, but only ten pound blocks are available. During renovation of the freezer floor, we found there to be frozen ground as deep as twelve inches below the surface! This is due to years of refrigeration above the surface. In some of the photos above, you can see the refrigeration lines in the freezer (covered with frost). 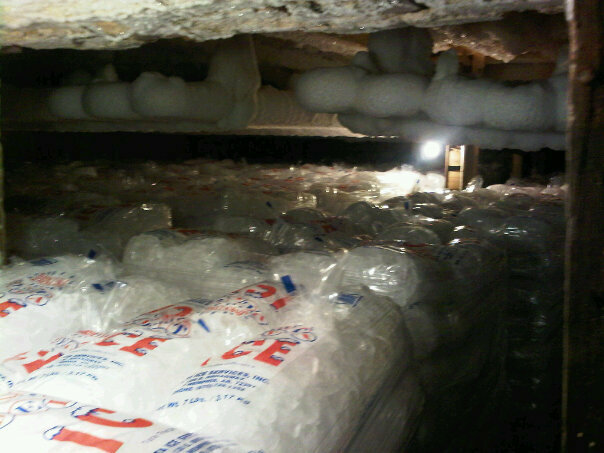 This is a radiant type of refrigeration, meaning there is no forced air fans or blowers in our storage freezer. Periodically (two to three times per year) we have to manually defrost these lines, just as in the old days. 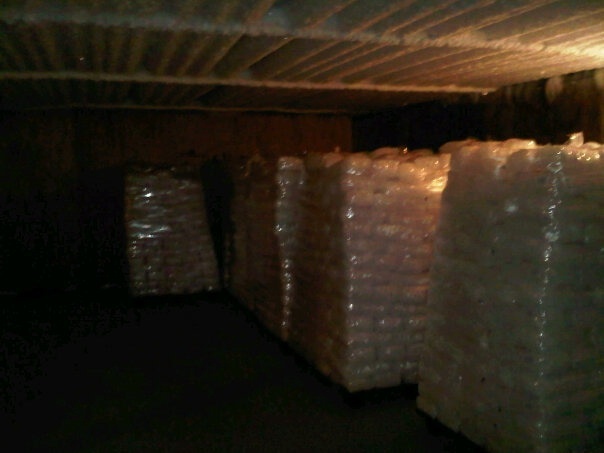 Due to the available space in the plant, this is still the most efficient means of storing ice. The temperature is between 26 and 28 degrees F year-round. This works great for ice, but not for other food items such as meat, poultry, or vegetables. This is because to safely store other food items, the temperature needs to be much lower than our freezer. Since it is more costly to cool the space to 10 degrees than it is to cool the space to 26 degrees, we don't even try. Yes, ICE IS A FOOD ITEM! We maintain strict inspection practices in our facility to ensure customer safety and compliance with local, state, and national guidelines. Our manufacturing equipment and practices ensure a quality and sanitary end product. The process is almost enterely automated, as opposed to other means. See the "Video of the Month" link on the home page for information that might make you sick! 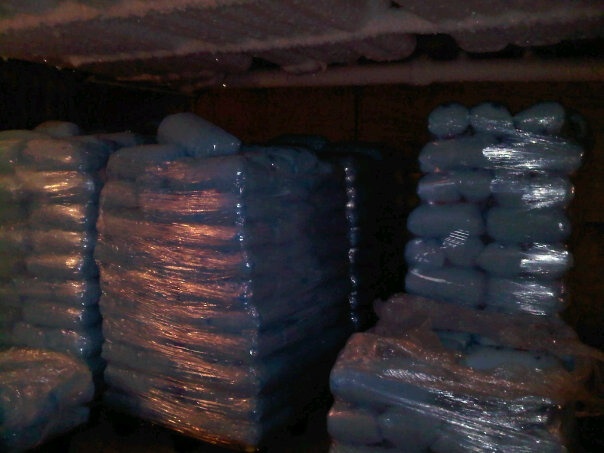 We take our own bags of Delta Ice home for personal use. It's MUCH better and healthier than other kinds of ice, because it doesn't add odors or tastes to our drinks, and there is no residue of impurities at the bottom of the glass. Elvis in his early days. The station was located right across the street from the icehouse, and Grammy award-winner James Cotton was known to have driven an ice truck for Delta Ice to earn extra money to support his music habit. tongs to grip the block tighter and the weight of the block as it was picked up made these tongs a portable handle for moving and handling the blocks. allow for modernization of the baggedice process, which included installation of an automated system of handling and bagging ice made in our plant. 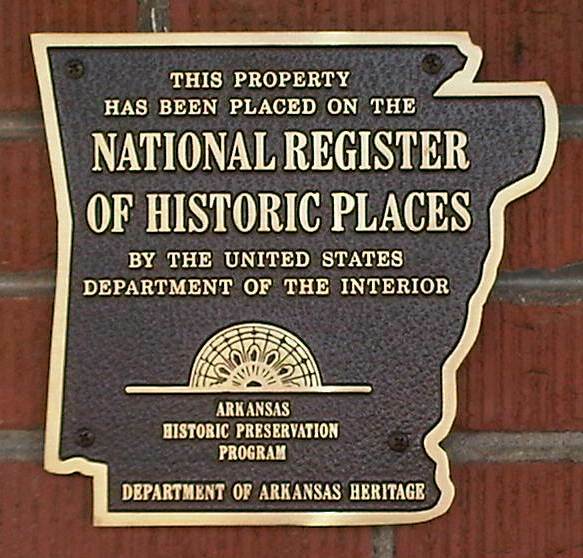 On Jan 21, 2010, the Wilson Power and Light Co Iceplant (operated today as J & K Delta Ice Service, LLC) was listed on the National Register Of Historic Places by the Arkansas Historic Preservation Program for its early significance to the "Main Street" district of West Memphis. 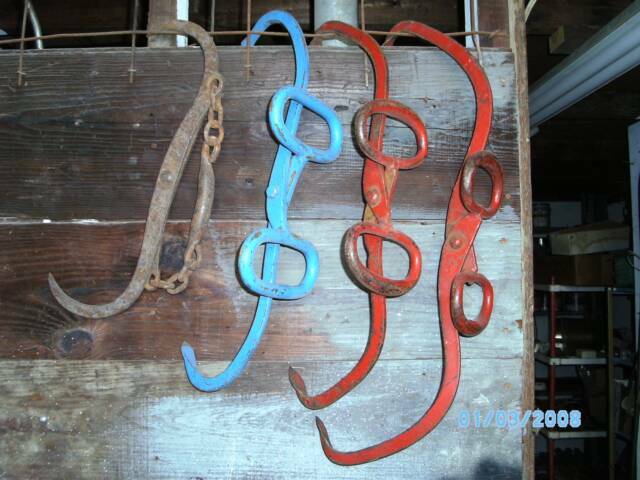 are true to their original design and configuration and are still in use today. 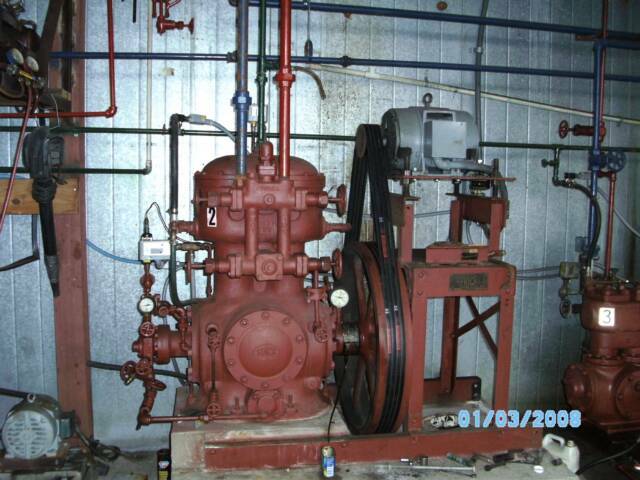 These are hardy machines and withstand heavy use with little maintenance. 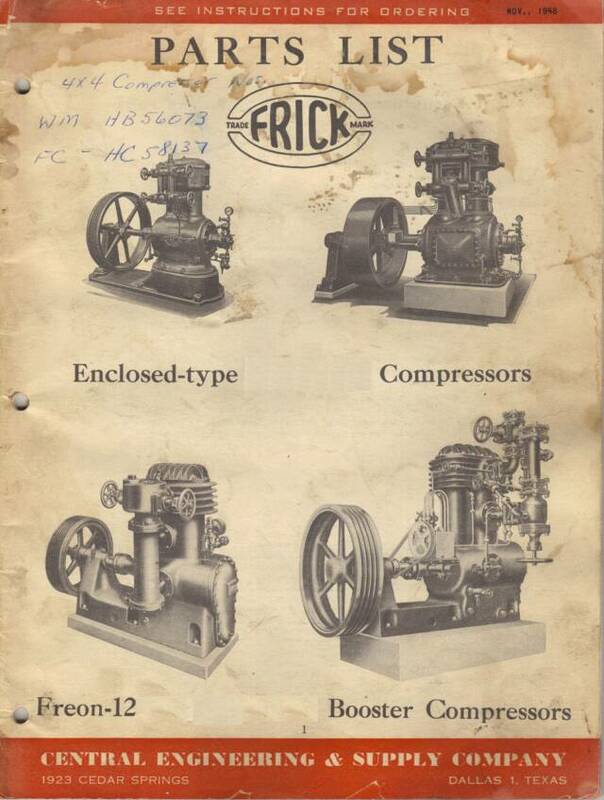 "They don't build them like they used to" is evidenced by an original copy of an "updated" service manual from November, 1948, seen in the image to the right of the compressor.